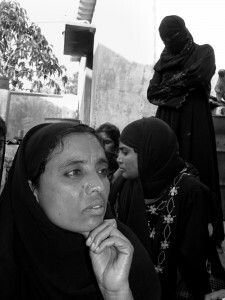 Hasnath Mansure feels that about 15% of women from poor Muslim family are literate. Lack of literacy coupled with poverty leads to suppression. She helps these women to become informed and take charge of their own lives. Poverty is the bane of Muslim women. Girls from poor families are married of by the age of 15, even in the cities like Bangalore. For a family struggling to earn a hundred rupees a day, one person less at home is one less mouth to feed. After marriage the girl becomes the responsibility of the husband!